Map of all the territories once occupied by the Roman Empire. The lands in cyan and magenta represent those whose conquest is doubtful, like Eastern Ireland. Hiberno-Roman relations refers to the relationships (mainly commercial and cultural) which existed between Ireland (Hibernia) and the ancient Roman Empire, which lasted from the time of Julius Caesar to the beginning of the 5th century AD. Ireland was one of only a few areas of western Europe that was not conquered by Rome. Rome never annexed Hibernia (the Latin name for Ireland) into the Roman Empire, but did exert influence on the island, although only a small amount of evidence of this has survived. This influence was expressed in three characteristic ways: commercial; cultural and religious; and military. The relationship between Rome and Hibernia was mostly commercial. Scholar Richard Warner  in 1995 wrote that after emperor Claudius invasion of southern Britannia, the trade routes between the Mediterranean sea and Roman Britannia encompassed even Hibernia. The geographer Ptolemy, in his map of the 1st century AD pinpointed the coastal settlements and tribes of Ireland, showing a knowledge that (it is suggested) only merchants could have achieved in that century. Additionally, there are many Roman archaeological objects (mainly jewellery and Roman coins) found in areas of central and southern Ireland (such as Tara and Cashel), that reveal a relationship. Roman coins have also been found at Newgrange. According to the theory of Thomas Charles-Edwards, who wrote about the Irish Dark Age, between the 1st and 3rd century there was a depopulating slave trade from Hibernia toward rich Roman Britain, that had an economy based on villa farming and needed slaves to perform the heaviest labour in agriculture. However the "Irish Dark Age" has been rejected by most recent scholars, and in the Late Roman period the evidence, including Patrick's autobiography, suggests that it was Irish raiders for slaves in Britain who were more significant. A hoard of cut up pieces of Late Roman decorated silver plate has been found in Ireland, paralleling finds at Traprain Law in Pictish Scotland, where the silver is usually seen either booty from raids, or a type of protection money to prevent raiding. The enigmatically mixed origins of the Broighter Hoard of gold objects, some in Celtic style (but perhaps British), and others in sophisticated Roman style, has raised several possible explanations. The religious influence of the late Roman Empire involved the conversion to Christianity of many Irish people by Saint Patrick in the century when the Western Roman Empire disappeared, shows that this religious faith was already present in Hibernia before the 5th century. The first reliable historical event in Irish history, recorded in the Chronicle of Prosper of Aquitaine, is the ordination by Pope Celestine I of Palladius as the first bishop to Irish Christians in 431 - which demonstrates that there were already Christians living in Ireland, before Palladius or Patrick. Prosper says in his Contra Collatorem that by this act Celestine "made the barbarian island Christian", although it is clear the Christianisation of Ireland was a longer and more gradual process. Apart from the introduction of a new religion, the cultural influence from Rome can be seen even in the clothes (and glades) of high-ranking people inside Celtic tribes of the 3rd and 4th centuries. The Ogham alphabet and writing system (which was probably first invented in the 4th century at Irish settlements in west Wales), was derived from the Latin alphabet after contact and intermarriage with Romanized Britons with a knowledge of written Latin. In fact, several Ogham stones in Wales are bilingual, containing both Old Irish and Latin-influenced Brythonic (the ancestor of contemporary Welsh) inscriptions. There is some evidence of possible exploratory expeditions during the time of Gnaeus Julius Agricola, although the interpretation of this is a matter of debate amongst historians. In places like Drumanagh (interpreted by some historians to be the site of a possible Roman fort or temporary camp) and Lambay island, some Roman military-related finds may be evidence for some form of Roman presence. The most commonly advanced interpretation is that any military presence was to provide security for traders, possibly in the form of an annual market where Romano-British and Irish met to trade. Other interpretations, however, suggest these may be merely Roman trading outposts, or native Irish settlements which traded with Roman Britain. Later, during the collapse of Roman authority in the 4th and 5th centuries, Irish tribes raided Britain and may have brought back Roman knowledge of classical civilization. The question of whether the Romans ever landed in Ireland has long been the subject of speculation, but in recent years firmer theories have emerged. Historian Vittorio di Martino writes in his book Roman Ireland that Agricola promoted an exploratory expedition to Hibernia, similar to the one Nero sent to explore southern Sudan in 61 AD, in order to organize a following military expedition to conquer Ethiopia (though this never came about because of his death). Indeed, the Roman historian Tacitus mentions that Agricola, while governor of Roman Britain (AD 78 - 84), considered conquering Ireland, believing it could be held with one legion plus auxiliaries and entertained an exiled Irish prince, thinking to use him as a pretext for a possible invasion of Ireland. This Roman author tells us that around those years Agricola had with him an Irish chieftain (may be Tuathal Techtmar) who later returned to conquer Ireland with an army. Excavations at sites linked to the tale of Tuathal have produced Roman material of the late 1st or early 2nd centuries. It would be consistent for Tuathal to have been that Irish chieftain. Clearly neither Agricola nor his successors ever conquered Ireland, but in recent years archaeology has challenged the belief that the Romans never set foot on the island. Roman and Romano-British artefacts have been found primarily in Leinster, notably a fortified site on the promontory of Drumanagh, fifteen miles north of Dublin, and burials on the nearby island of Lambay, both close to where Tuathal Techtmar is supposed to have landed, and other sites associated with Túathal such as Tara and Clogher. However, whether this is evidence of trade, diplomacy or military activity is a matter of controversy. It is possible that the Romans may have given support to Túathal, or someone like him, to regain his throne in the interests of having a friendly neighbour who could restrain Irish raiding. Furthermore, the 2nd-century Roman poet Juvenal, who may have served in Britain under Agricola, wrote that "arms had been taken beyond the shores of Iuverna (Hibernia)", and the coincidence of dates is striking. Although Juvenal is not writing history, it is possible that he is referring to a genuine Roman military expedition to Ireland, according to Philip Freeman. It is also speculated that such an invasion may have been the origin of the presence of the Brigantes in Ireland as noted in Ptolemy's 2nd century Geography. The Brigantes were a rebellious British tribe only recently conquered in Agricola's time. The dispossessed nobility may have been ready recruits for Tuathal's invasion force, or the Romans may have found it a convenient way of getting rid of troublesome subjects, just as Elizabeth I and James VI & I planted rebellious Scots in Ireland in the 16th and 17th century. Other tribal names associated with the south-east, including the Domnainn, related to the British Dumnonii, and the Menapii, also known from Gaul (Roman France), may also date from such an invasion. 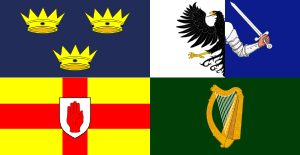 Ireland was culturally Romanized after Saint Patrick and Saint Palladius spread the conversion of Christianity in all Hibernia during the 5th century. One of the first churches in Hibernia was founded by Saint Palladius in 420 AD, with the name House of the Romans (Teach-na-Roman, actual Tigroney). 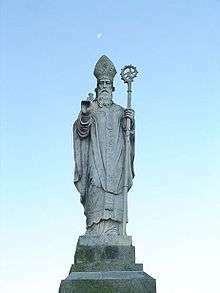 The Romano-British Saint Patrick promoted the creation of monasteries in Hibernia and the older druid tradition collapsed, in the face of the new religion he brought. In the monastic culture that followed the Christianisation of Ireland, Latin learning was preserved in Ireland during the Early Middle Ages in contrast to elsewhere in Europe, where the Dark Ages followed the decline of the Roman Empire. In those monasteries, Hiberno-Latin was a learned sort of Latin literature created and spread by Irish monks during the period from the 6th to the 10th centuries. 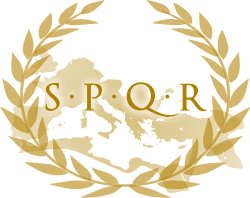 ↑ Richard Warner "Tuathal Techtmar: a myth or ancient literary evidence for a Roman invasion? 1 2 Cahill, Tim (1996). How the Irish Saved Civilization. Anchor Books. ISBN 0-385-41849-3. ↑ Dowley, Tim; et al., eds. (1977). Eerdman's Handbook to the History of Christianity. Grand Rapids, Michigan: Wm. B. Eerdmans Publishing Co. ISBN 0-8028-3450-7. Charles-Edwards, Thomas. Early Christian Ireland. Cambridge University Press. Cambridge, 2000. Cooney, Gabriel. Ireland, the Romans and all that from Archaeology Ireland, Spring 1996. Di Martino, Vittorio. Roman Ireland, The Collins Press. London, 2003.